"Los Angeles is home to many great storytellers, but Nina Revoyr is one of its finest scribes.... Lost Canyon] pulses with both beauty and terror, and the struggles of these characters, their physical and mental reckonings, are enough to make readers sweat without getting off the couch." "Revoyr is] an edgy and spellbinding writer with an uncanny gift for aligning human struggles with nature's glory and perils....With ravishing descriptions of the magnificent landscape, unrelenting suspense, incisive psychology, and shrewd perspectives on matters of race and gender, Revoyr has created a gripping tale of unintended adventure and profound transformation." "A suspenseful adventure story that explores how people react to danger, uncertainty, fear, and life-or-death choices....This is an exciting, page-turning adventure story that reveals how good people can do things totally contrary to their own moral code, and the conclusion will both surprise and satisfy." "Revoyr travels LA's patchwork neighborhoods--delineating gangs and money, color and prejudice--and nicely sketches 'the grand, untamed Sierra.' Like Deliverance, a tense...morality tale formed in the crucible of physical duress." "With a nod to James Dickey's Deliverance...A direct, bangin' read for those interested in how people deal with physical and moral challenges." "An exciting blend of literary fiction and thrilling suspense--a harrowing trip into physical danger and a clever meditation on race relations and bravery." "What a pleasure it is seeing characters that live and breathe in the same textured universe that we do....Linked to complicated national issues, imbued with layered representations of Angelenos, Revoyr] has brought us an intellectually adroit, emotionally nerve-wracking, page-turning thriller." "Even at its deadliest, Revoyr makes the high altitude seem mesmerizing....Revoyr has created characters we care for, issues we need to think about, and vistas that linger, making reading her book almost as much of a rush as scaling the sheer, icy rock of the Sierra Nevada." Four people on a backpacking trip in the Sierra Nevada find more adventure than they ever imagined. Each of them is drawn to the mountains for reasons as diverse as their own lives. Gwen Foster, a counselor for at-risk youth, is struggling with burnout from the demands of her job and with the loss of one of her teens. Real estate agent Oscar Barajas is adjusting to the fall of the housing market and being a single parent. Todd Harris, an attorney, is stuck in a lucrative but unfulfilling career--and in a failing marriage. They are all brought together by their trainer, Tracy Cole, a former athlete with a taste for risky pursuits. When the hikers start up a pristine mountain trail that hasn't been traveled in years, all they have to guide them is a hand-drawn map of a remote, mysterious place called Lost Canyon. At first, the route past high alpine lakes and under towering, snowcapped peaks offers all the freedom and exhilaration they'd hoped for. But when they stumble onto someone who doesn't want to be found, the group finds itself faced with a series of dangerous conflicts, moral dilemmas, confrontations with nature, and an all-out struggle for survival. Moving effortlessly between city and wilderness, Lost Canyon explores the ways that race, class, and culture shape experience and perception. It examines the choices good people must face in desperate situations. 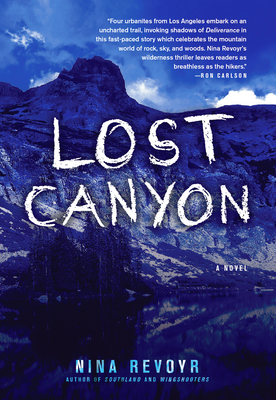 Set in the grand, wild landscape of the California mountains, Lost Canyon is a story of brewing social tensions and breathtaking adventure that will keep readers on the edge of their seats. Nina Revoyr is the author of four previous novels, including The Age of Dreaming, which was nominated for the LA Times Book Prize; Southland, a Los Angeles Times best seller and "Best Book" of 2003; and Wingshooters, which won an Indie Booksellers' Choice Award and was selected by O, The Oprah Magazine as one of "10 Titles to Pick Up Now." Revoyr lives and works in Los Angeles. Lost Canyon is her latest novel.